The first Indian casino in New York was the Turning-Stone Casino Resort. It opened on July 20, 1993. This casino is owned by the Oneida Nation of New York. The tribe owns 2 other casinos: Point Place Casino in Brideport, NY and Yellow Brick Road Casino in Chittenango, NY. The Oneida also own four SavOn Gas and Cigarettes stores with Indian gaming. The Turning Stone offers gaming, entertainment, dining, world-class golf, and resort accommodations. It is located 20 miles west of Utica on Hwy 365. In November 2016 plans were announced on a $20 million renovation project. The casino will be installing new chairs, furniture, and flooring. There will also be a new area designated for smoking guests. The hotel will also be undergoing upgrades to 285 guest rooms. The project is scheduled to be completed by early 2017. Bingo - 1,350 seats - see our High Stakes Bingo page for full information. Keno - games called every 5 minutes. Wagers start at $2. Includes Blackjack, Craps, Caribbean Stud Poker, Let it Ride, Roulette, Acey Deucey (Red Dog), Pai Gow Poker, Three Card Poker, Four Card Poker, Baccarat, Sic Bo, Texas Hold'Em, Mini Bac, Midi Bac (Macau style), Big Six Money Wheels, Casino War. Computerized player waiting lists displayed on four 65" screens. Wildflowers - 65 seat restaurant at the Lodge. There are 700 guest rooms and suites. AAA Four Diamond award-winning all-suite hotel. Two-room suites average 550 sq. ft. with separate living room and bedroom. AAA Three Diamond award-winning hotel features 268 rooms with 28 suites located in the center of the resort. THE INN - see our page "Inn at Turning Stone Resort Casino"
175 paved sites with full utility hookup. Shuttle bus is a short ride from Turning Stone Resort Casino. Spa Finder Wellness Readers' awards for Best Spa for Men, Best Casino Hotel Spa, and Best Spa for Golf. 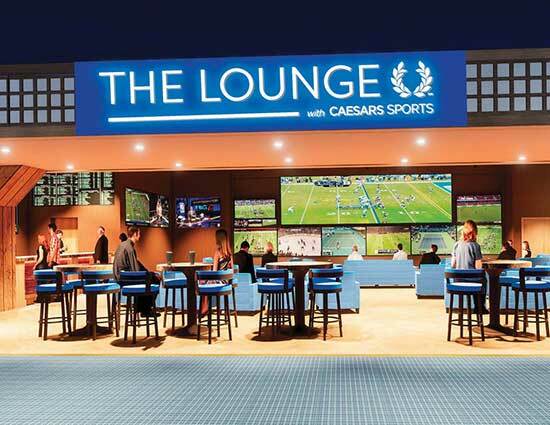 Turning Stone's "The Lounge with Caesars Sports"
The Oneida Nation is preparing to open betting lounges in each of their three casinos in anticipation that New York State will allow sports betting sometime this year. Therefore, they have taken two important steps in recent days towards opening a sport betting operation. First, they selected Scientific Games to install SG Digital's sports betting platform in each of their casinos. This is an advanced betting system designed around players. The agreement will be sent to the National Indian Gaming Commission (NIGC) for review and approval. 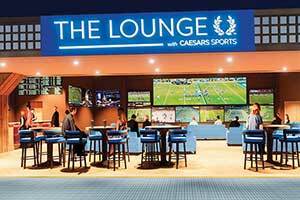 Second, the Oneida signed a licensing partnership with Caesars Entertainment to use the branding name "The Lounge with Caesars Sports" in the their casino. This agreement will also be submitted to the National Indian Gaming Commission for review and approval. The Turning Stone lounge will feature a 9-foot by 4-foot curved screen TV plus twelve 65-inch TVs and five 85-inch TVs. The betting lounges will open first at Turning Stone Resort Casino and Point Place Casino followed later by the Yellow Brick Road. 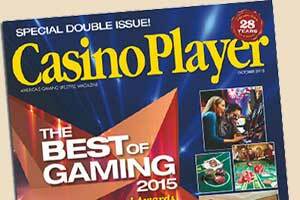 Recently the winners for Casino Player Magazine annual awards were announced. For three years in a row the #1 Best Overall Gaming Resort in New York has been awarded to the Turning Stone Resort Casino. This year, the resort casino has won 18 awards. Guests to all the casinos were given the opportunity to cast their votes for the different categories for the magazine's annual awards. 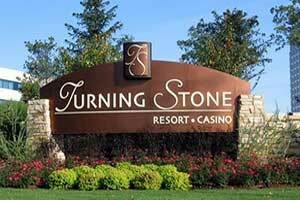 Overall eight first place titles were awarded this year to the Turning Stone Resort Casino. The Turning Stone was voted the best in: overall gaming resort, table game tournament, live poker, blackjack, bingo, hotel, poker tournament, and table game tournament. The Shenandoah Golf Club also won for Best Golf Course. Other wins for Turning Stone Resort Casino were for best casino, craps, high limit room, dealers, roulette, and non-smoking casino. The resort also won for best rooms, spa, pool, and favorite casino resort to vacation at. 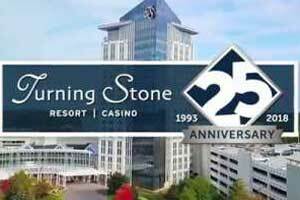 The Turning Stone Resort Casino is celebrating its 25 years in operation. Three Four Star awards were previously awarded to the resort casino earlier this year. Also, Three Four Star Diamond Awards were also given by AAA. Located 30 miles to the east of Syracuse in Upstate New York, the Turning Stone Resort Casino is owned by the Oneida Indian Nation. The property offers a casino gaming floor of 125,000 square feet, four hotels, two spas, over 20 dining venues, an event area with 5,000 seats, a showroom, and five golf courses. 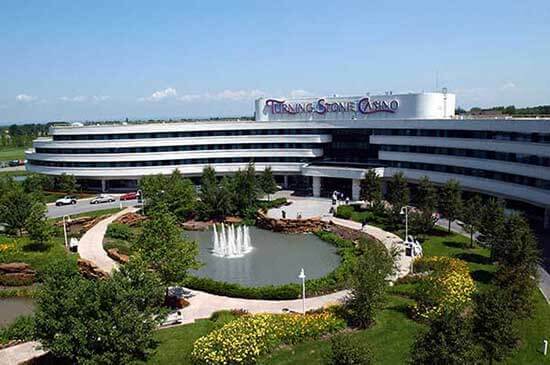 The Turning Stone Resort Casino opened 25 years ago today. Located in Upstate New York, the casino resort is owned by the Oneida Indian Nation. It is the flagship casino resort for the tribe. A celebration was held in honor of the anniversary in the Showroom. The room consisted of officials from Central New York and Oneida County. Also, hundreds of employees. Some of which have been with the casino resort since the opening 25 years ago. A cake was made by the pastry chefs at the resort. It was designed as a replica of the Turning Stone Resort Casino property. It will be on display for guests to see in The Winter Garden at Turning Stone. In the 1980's the tribe opened a bingo hall. In the 1990's the idea of expanded the bingo parlor into a casino began putting plans together. Over time, they faced lawsuits and other hurtles in their project. The tribe continued to push forward and eventually were able to grow their enterprise into the large casino resort that it is today. In 1993 the original casino building was opened. Located on 400 acres in Verona. Two years later slot machines were added. Also, the bingo parlor was moved to a new location on Patrick Road. In 2002, the building was renovated that enlarged the gaming floor to its current layout. The Turning Stone Casino Resort has also been a source for needed employment for the area. In 1995 Griffiss Air Force Base closed. Many people were laid off. The casino resort offered employment opportunities for many of those people. Throughout the summer months, special events will be held to continue the casino resort's 25th anniversary. It is expected that this fall there will be an announcement regarding the future expansion of the casino. Opposition to sports betting in New York State has been voiced by the Oneida Indian Nation. Recently the tribe submitted a letter to Gov. Andrew Cuomo stating their disagreement with the state legislature. Point Place Casino and Turning Stone Resort are both owned by the tribe. The tribe has been long opposed to the legalization of sports betting in New York. They believe it is a violation of their gaming compact with the state to allow sports betting to be offered at other gaming venues outside of the Oneida Indian Nation owned venues. Under the proposed law the game could be operated by kiosks, phone apps, and other computer based means. The compact states that gambling and casino gaming will take place at no more than seven authorized casinos. If the new law goes into effect, the tribe believes this would be a violation since the game could be offered through a variety of different gaming options. Arrangements and plans to offer sports betting are underway for the Oneida reservation. No date has been released for when the game will be offered. However, the tribe did state in a statement it would be in the near future. That statement was released on Monday by Joel Barkin, a spokesman for the tribe. 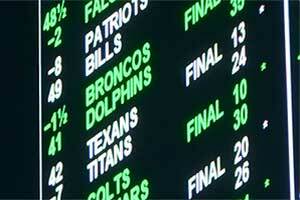 Sports betting at commercial casinos in New York was passed in a 2013 law. However, it is not known at this time if those gaming venues will begin the operation of the new game. New laws need to be approved first in order to expand wagering. In May it is expected that commercial casinos will begin offering sports betting. After the U.S. Supreme Court ruled that sports betting could be now be offered, an announcement was made by the Oneida Indians. The tribe will begin to operate sports betting as one of their games. They are located in central New York in Verona. They are the owners of Turning Stone Casino. The ruling over turned the previous federal law and gave authority to states to determine if they would allow the game to be operated. The tribe intends to begin operating the game soon. Plans have been in the process since the law was being challenged and being heard by the courts. Under the gaming compact negotiated between the state of New York and the Oneidas, allows for their casino to operate any of the state approved games. Additional approval is not required to be given from the state for the tribe to begin offering sports betting. There are currently a variety of different games offered at the tribe's casinos. Sports betting will now be added to the list of games. The official start date has not been released. However, it will be soon. The third casino owned by the tribe opened earlier this year. The addition of sports betting to the list of offered games at the casinos will increase the amount of employees needed. The new game will also bring more guests. The tribal nation intends to add sports betting to their list of offered games as a way to bring new revenue opportunities.